1. 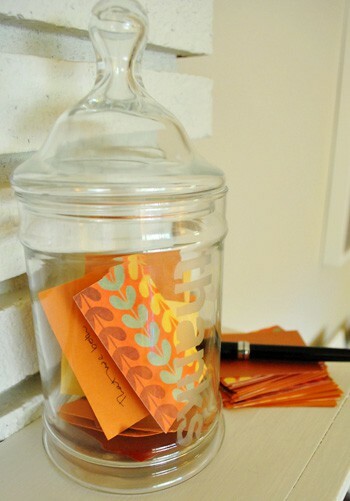 Make a Gratitude Jar. Read more here. 2. Have some fun with the words Gratitude and Attitude with this simple object lesson. 3. 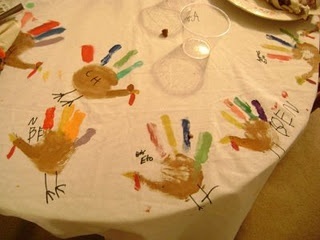 Make a tablecloth using kid’s hand prints. Pull it out each year. 4. Play charades. Each team writes things they are thankful for on small pieces of paper. The other team draws one at a time and acts these things out. 5. Have each child stand with a chalkboard (or paper) telling something they are thankful for. Take a picture. Keep the pictures in an album and add to it each year. >>What two positive words describe the person sitting on your right? >>What is the most significant gift you have ever received? >>Describe your most memorable Thanksgiving. >>If you could ask any Bible character to Thanksgiving dinner, who would it be? Why? 7. Make a photo booth with Thanksgiving props. Have fun taking pics. Free downloadable props here. 8. 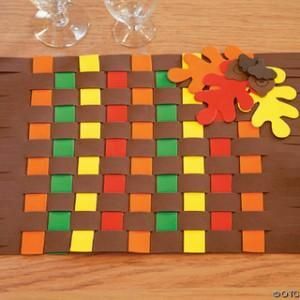 Keep kids busy by weaving placemats. 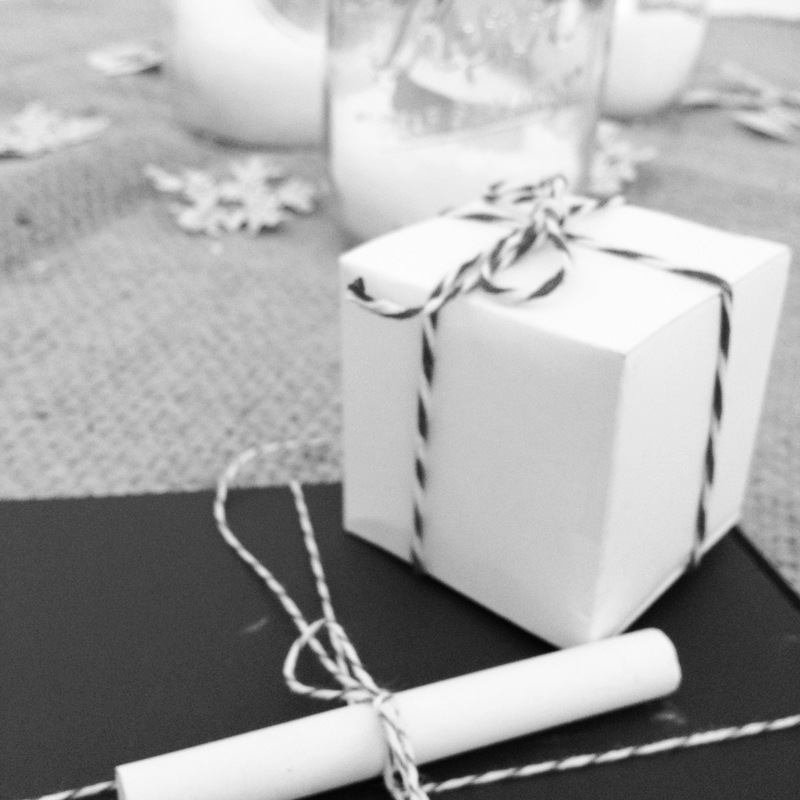 Find instructions here along with other craft ideas. 9. Go turkey bowling. 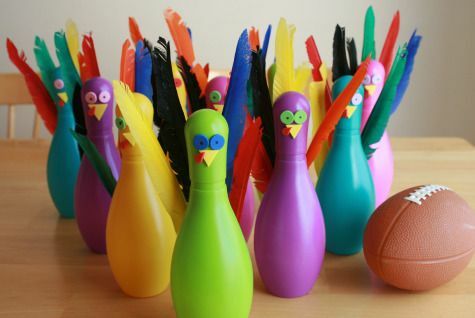 Just make these bowling pins and roll a football toward the turkeys. 10. 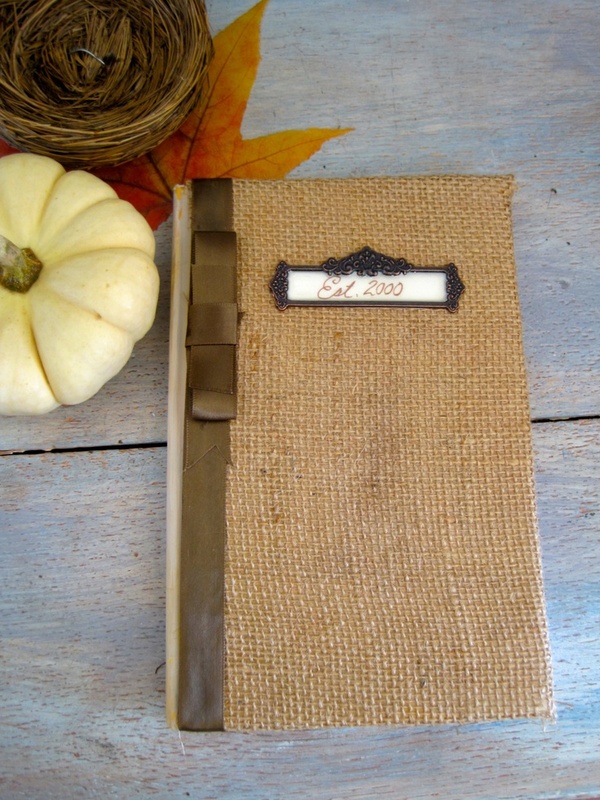 Make a gratitude journal. Each year add to it. Nothing fancy, just simple lists of what each family member is thankful for. Think how much fun it will be to read this in the future. 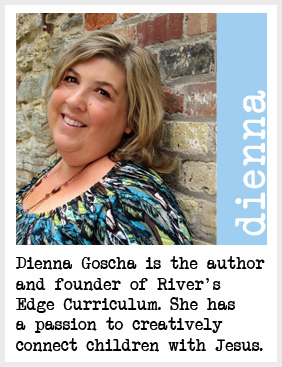 Interested in more ideas? Read this or this. And find more ideas on our Pinterest board. What have you done creative to make Thanksgiving memorable in your home? 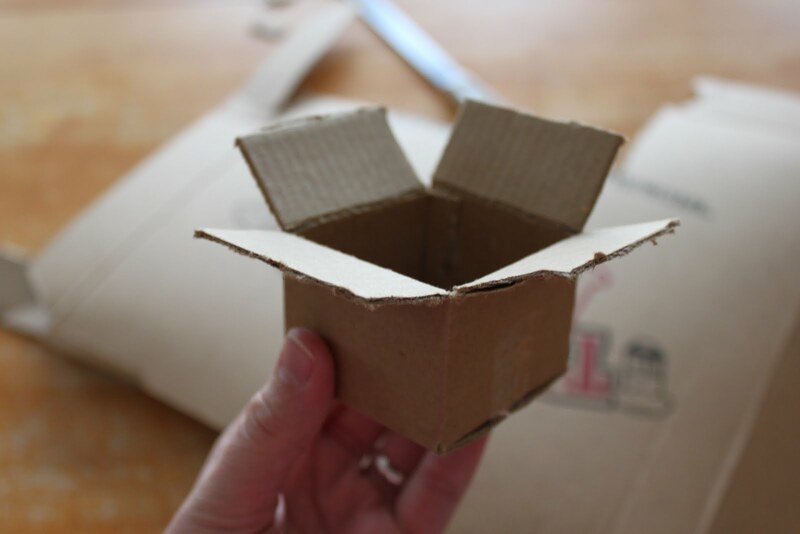 Preparation: Place a band-aid in the box. 1. Part of it is sticky. 2. Sometimes your mom or dad will put this on you. 3. You use it when you have hurt yourself. Today’s Bible story is about someone who chose to be thankful even when those around him were not thankful. One day Jesus was entering a village. There were ten lepers that stood far away from Him. A person who is a leper has a disease that changes their skin. Leprosy was a terrible disease to have. In Jesus’ time, those who had this disease had to stay away from those who did not have it. It was lonely way to live. 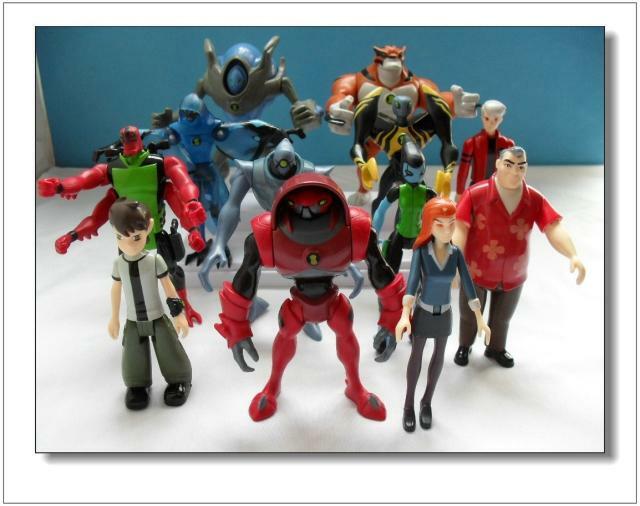 Let’s line up 10 (blocks, action figures) and pretend these are the lepers. They did as he told them. And as they went on their way, their leprosy went away. Their skin was good as new. They were healed! Let’s turn the lepers around and have them go to the priest. Can you help me? But one leper stopped when he saw he was healed. He turned around and came back to Jesus. He shouted, “Praise God!” Can you say that with me? He feel to the ground right at Jesus’ feet and thanked him for what He had done for him. Let’s make the choice to be thankful. We can be thankful to Jesus for loving us. Thank Jesus for each child and for loving them. Allow individual children to say a prayer of thanks. Have the children sit in a circle. Go around the circle and ask each child what he/she is thankful for. Have the children repeat the verse after you. What does it mean “in all circumstances?” That means always. For instance, it means being thankful when someone gives you a cookie even if it is not your favorite kind. Let’s do motions with this verse to help us learn it. Play tag. 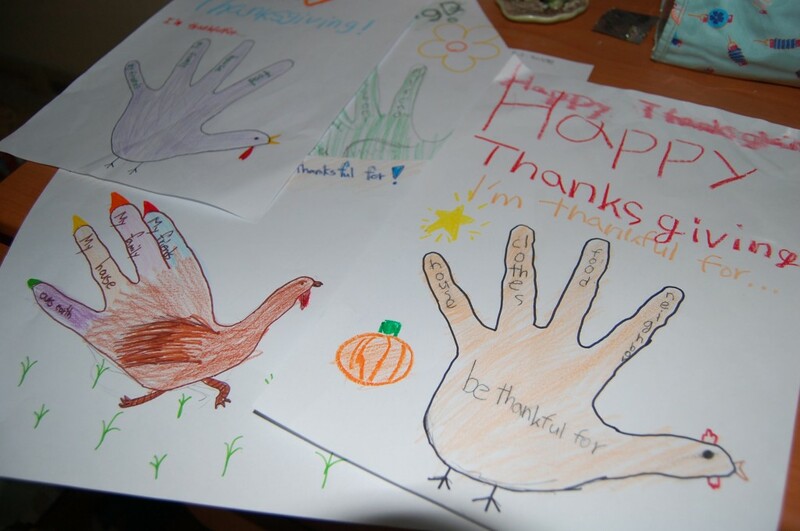 When tagged, each child must say something he/she is thankful for. Trace each child’s hand with the crayon. Write what they are thankful for on each of the fingers. Draw a turkey face on the thumb. Finish coloring. Imagine opening up this blog every day in December and a fun, easy and creative idea pops out at you. Ideas that sometimes are meaningful, sometimes are just silly and sometimes make you think in a different way. Ideas that might be pinterest worthy and others that might keep your sanity during a pinterest- saturated season. We would love to post some of your ideas. If you have an idea you would like to share with us, please email riversedgechristmas@gmail.com with a picture, the instructions or whatever we need to share the ideas. Please do not email pictures of kids unless you have permission to do so (or they are your kids). What fun things have you done in the past that have been meaningful? Creative? Sanity saving?